A monochromatic outfit is one of the chicest, foolproof looks you can wear. There’s nothing easier than throwing on a head to toe black outfit and immediately looking like a million bucks. When it comes to a colorful monochrome outfit, it’s a little more tricky. When wearing a monochromatic look, playing with textures is important. It gives the outfit more depth and makes it look less flat. So play around with fabrics and textures so you’re outfit won’t look like you’re just wrapped in one sheet of fabric. When going with a safer color, such as black, choosing one shade for the whole outfit is absolutely fine. But with a difficult color, like red, sticking to one shade can be a little over the top. Picking the same shade of red and wearing it from head to toe would’ve probably made me look like the Kool-Aid man! Instead, I played around with different shades. 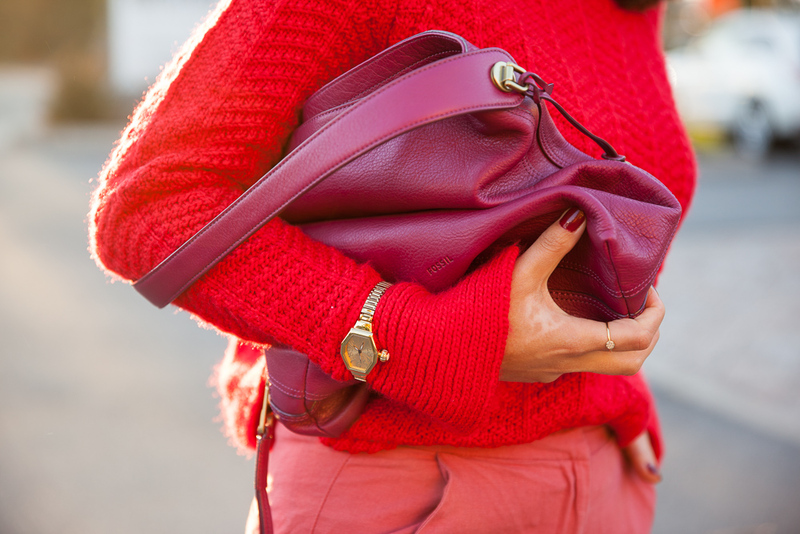 The sweater a bold tomato red, the pants have a pink tint to them, the bag has a purple undertone and the shoes a deep burgundy. By that, I made sure my monochromatic outfit isn’t falt. It’s contrasty and interesting. When wearing a monochrome look, you should also focus on your accessories to break down the rigidity of your look. They’re a great way to distract the eye and to town down your outfit. Although I won’t be wearing bold monochromatic outfits on a daily basis, it’s definitely fun from time to time. It made me feel like a fashion editor walking the streets of Paris during fashion week and I loved it. 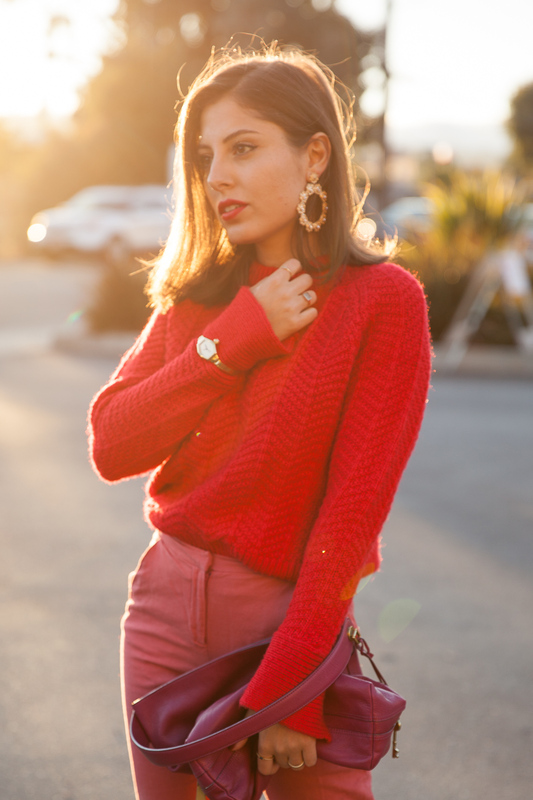 Will you wear a head to toe red look? Also, I just uploaded my very first designer bag unboxing video on my Youtube Channel! If you missed the first unboxing on my Instagram Stories make sure to check it out! I’m so glad you liked it, Courtney! Ok you ROCKED this monochromatic look! I would normally be too scared to wear a colorful monochromatic outfit but you make it look so chic and effortless! Thank you, Kelly! I was scared at first but I wanted to challenge myself a little. I think you’ve done a fabulous job here, Tamara! The texture thing makes it so fabulous!! I saw a women at the airport once in all black but many different textures, and it looked wonderful!! Thank you, Jodie. Different fabrics and textures elevate a monochromatic look because of the different ways the light hits them! You look stunning! I”m a big fan of the monochromatic trend! You look stunning in your different shades of red! You rock the color red Tamara! Such a chic look! I adore the fit of those pants. I’ve been wanting to try this and of course you nailed it! I like the skinny pants with the chunkier weight sweater. You look AMAZING in this red monochromatic outfit! So gorgeous! Great outfit for fall, like an energetic drink!! I like your style and your outfits very much, thanks for sharing! I also like reading the description, it’s very useful and clear. You captured it and outfit is on point. you are so right! what is easy when comes to black can be a bit more trickier with other hues! You did it tho and you look fantastic in red! That red looks so gorgeous on you! Fantastic combo, I love it. Love this bold monochrome look! Your heels are amazing! I am obsessed with this look Tamara, It is so bold of you to wear an all red outfit. Red is one of my favourite colours. You look fabulous. That’s a nice colored look! And beautiful photos! I find this post the sexiest! I love the way you pull-off the all Red. So seductive! Loving this look dear. Red is truly the color of fall. Those heels are fabulous too! Amazing pictures, I really like your styling!! Fabulous pics, love the golden light and your outfit ! YOu really know how to walk bold!! Great one! I love your beautiful red on red look here, is so bold and beautiful, one of my favourite colours to wear as it’s so warming. I love how you put this outfit together. I’m an all black person and I am slowly embracing the bright colors. Super beautiful outfit! I love monochromatic looks!